BIG, scary, huge, wild, wet and dangerous; these are just a few of the adjectives people often hear describing rapids on the Colorado River in Grand Canyon. Many videos and movies depict enormous rapids without end, resulting with rafts flipping all the time. For the novice rafter, this creates a misguided impression as to the true nature of the river and her rapids. The reality is that well over 95% of the river in Grand Canyon is flat, calm water. In fact, many of the named rapids on the Colorado River are not that huge and are quite easily navigated. See a definition of each italicized word in this article in the Grand Canyon Glossary. The Colorado River through Grand Canyon has a very low average gradient of just under 8 feet per mile. In the case of the Colorado in Grand Canyon, the average gradient covers about 277 miles from Lees Ferry to Grand Wash Cliffs. Compare that to the Missouri River which at its steepest averages 9 feet per mile, and that section has no whitewater. Most commercially rafted whitewater rivers have gradients between 25 and 60 feet per mile! The low gradient of the Colorado River through Grand Canyon would lead one to believe it is a flat water river, yet there are about 83 rapids. So why are there ANY rapids at all and why are some of those rapids so big in Grand Canyon? The answer lies in the numerous side canyons and drainages of the Grand Canyon. Most of the side canyons and drainages have extremely high average gradients, in most cases thousands of feet per mile. While the majority of these side canyons are dry, when they flood, huge amounts of water can move down them as flash floods. The steepness of these drainages increases the velocity of the water and its power to move giant boulders and massive amounts of solid material. 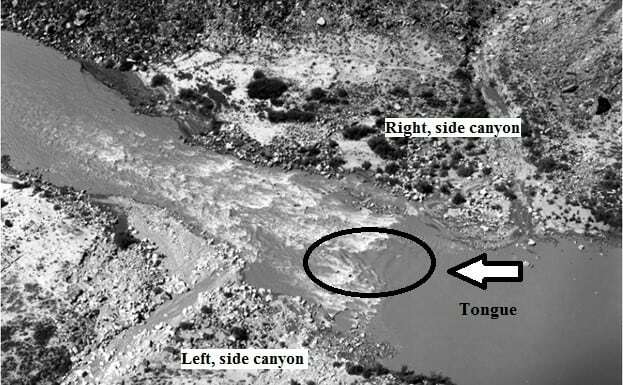 Sometimes landslides occur during the flooding events and combine with the water in the side canyon to make slurry of mud that can actually float giant boulders weighing many tons. When this occurs, it is called a debris flow. Over time, and occasionally as single dramatic events, these rocks reach the main channel of the Colorado at their confluence. This clogs up the river, creating a dam across the river bed and narrowing the channel. All but a couple small rapids in Grand Canyon are made by these side canyon drainages. The floods and debris flows of the side canyons are essentially the ONLY reason there are rapids in Grand Canyon! As the water flows over the obstruction of boulders and through the narrower channel created by these natural dams, it picks up speed. Some waves within a rapid are made by water going over boulders near the surface, but most waves in the main channel are caused by fast water moving steeply downhill in a narrowed channel and slamming into the slower water below the rapid where the river bed begins to return to its normal low gradient. When the fast water hits the slower current or a narrowed channel, it has nowhere to go but up, creating what is called a hydraulic jump wave. This is the term used in hydraulic science http://en.wikipedia.org/wiki/Hydraulic_jump. Your guides will call these standing waves or tail waves. Usually, this is where your guide will place your raft for the best ride in the rapid! While the larger of these type waves are intimidating, these “straight forward” rapids are not particularly challenging to navigate. At the site of these side canyon boulder choking “dams”, the river backs up, creating a slow ‘pool’ above the rapids and a horizon line over the drop when looking downstream. A raft entering a rapid will float agonizingly slow across the lake-like pool above the rapid to the edge, or the lip of the rapid. Generally, the guide will place the raft in the current of the tongue, a V shaped section of smooth water that indicates the deepest part of the channel through the obstruction. Suddenly, the raft will plunge over this smooth tongue at the lip of the rapid, until it hits the first of a series of waves that the V shaped tongue of smooth fast current will invariably slam into. Is the Colorado River A Technical River? The largest rapids in Grand Canyon are known for having huge waves. Even some of the smaller rapids have some nice-sized waves. However, few Grand Canyon rapids are technical. Technical rapids require making one or more moves. In addition, they may require a change in direction when navigating a rapid, usually moving out of the tongue. The more moves required to successfully navigate a rapid, the more technical and challenging the rapid. Most Grand Canyon rapids only require the raft to enter a rapid at a fairly precise location before the rapid actually begins. Guides can then float down the tongue and into the wave train. In this scenario, the guide only needs to hit the waves straight on, with the bow of the raft perpendicular to the angle of the waves. It’s best to enter the rapid with enough momentum to keep the raft from slowing down on the uphill side of the wave “faces” (the part of the wave presented to the oncoming raft). The few technical Grand Canyon rapids typically have large breaking waves, holes (also known as hydraulics or keepers), and/or occasionally rocks or cliff walls that need to be avoided. The Grand Canyon rapids considered the most technical (this varies with water levels) are: Hance, Crystal (the two longest rapids in the canyon), Bedrock, Deubendorf, and House Rock. At lower water levels, a few other rapids become more technical, because more rocks or sharper holes appear. The Colorado River is a ‘big water’ river, meaning it has a high volume of water. On average, it is a much higher volume than the typical whitewater river. The cubic feet per second (cfs) of the Colorado through Grand Canyon averages 12,000-15,000cfs in the commercial rafting season. Flows can be as low as 5000cfs and as high as 25,000cfs depending on energy needs, which dictate dam releases. For reference, smaller whitewater rivers have gradients between 25-60 feet per mile. Most rivers consider river flows of 5000cfs or more as high water. Higher cfs flows (and certainly a 25,000cfs flow), would be considered an unsafe flood stage for these smaller higher gradient rivers. Pre-dam, the Colorado River frequently ran as high as 100,000cfs in the spring and some years substantially more. In recent years, there have been temporary high flow dam releases between 35,000cfs and 46,000cfs. Studies have shown that these high flows help with rebuilding sand beaches. In 1983, the river through Grand Canyon had a peak flow of approximately 100,000cfs. This high flow was due to an exceptionally big snow pack in the upper Colorado River basin of Colorado and Wyoming, as well as a miscalculation by the government agency regulating the Glen Canyon dam. 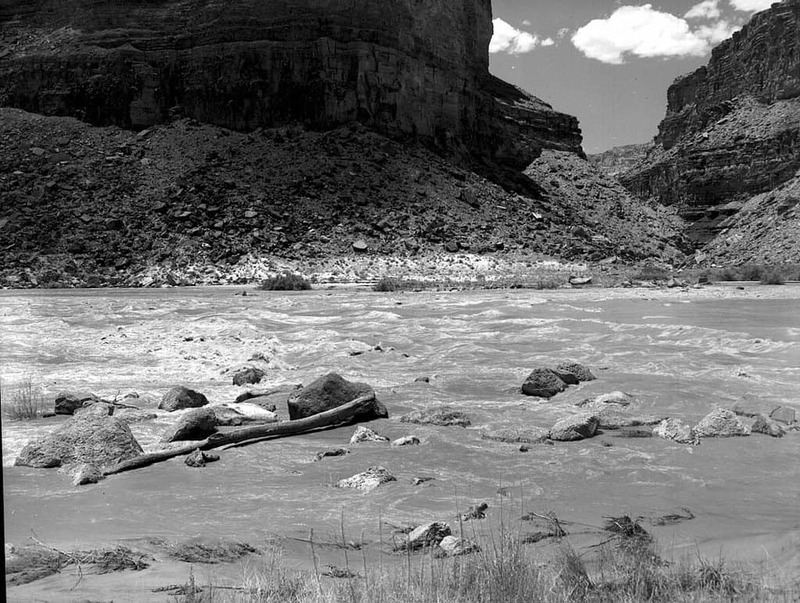 High water flows of the Colorado River change the configuration of the rapids and over time remove the obstruction of the natural dams. So while the side canyons are constantly adding debris, this big volume river is constantly removing it. To sum it up, the larger, steeper and narrower the constriction of the river channel, the bigger the waves. The biggest constrictions or natural dams only occur at a few side canyons. And higher volume water flows (cfs) usually increases wave size. So what does all this talk of cfs, high volume, natural dams, low gradient and hydraulic jump mean for you? It means, that on your raft trip, you’ll float lazily along this calm serene river enjoying the scenery, and then run through white-knuckle gripping BIG waves and BIG fun! We have very limited space left for this year, and a bit more available for 2020. Call or email us today to reserve your rafting adventure! 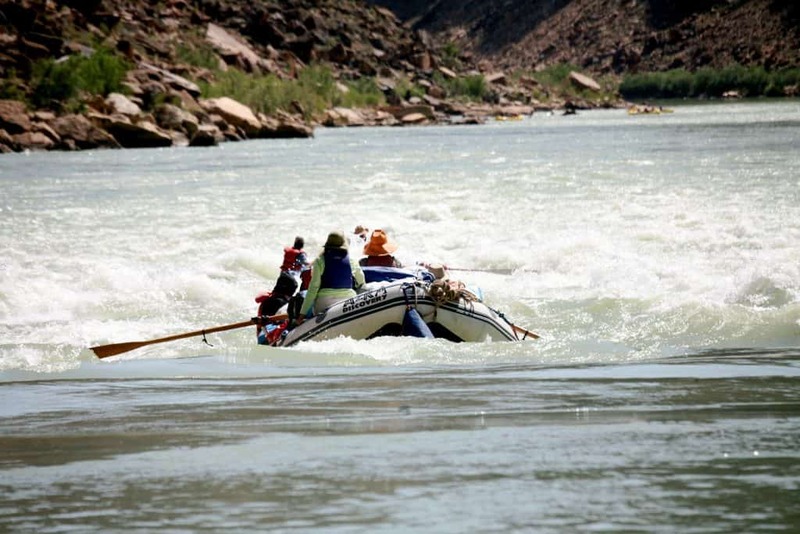 For more information on the Colorado River and its rapids in Grand Canyon, go to American Whitewater Association. Like what you see on the AzRA blog? Sign up here to receive an email notification when anew article posts. Email used for article notifications only.